On Thanksgiving it’s easy, if not obligatory, to be grateful for your blessings. It’s the one designated day a year that we celebrate gratitude. But what would your life be like if you celebrated gratitude every day? How about abundant, fulfilling and happy? When you are grateful, you affirm to yourself and the universe that what you have is enough. It means you are at peace with the present moment. This will fill your heart with joy. And this my fellow Karousers, is what attracts more even more blessings. Granted, it’s difficult to celebrate gratitude every day. Some days we just don’t feel grateful, but that’s when we need gratitude the most. This is when practicing comes in handy. 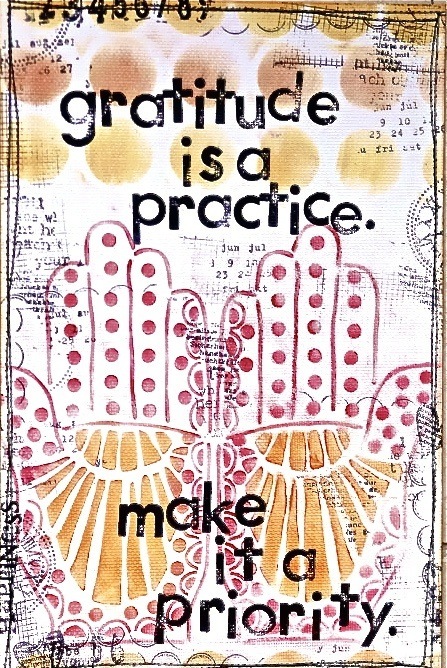 Practicing gratitude is like practicing yoga – it’s something we work towards mastering. It is a life long journey. If you practice gratitude every day, especially when you don’t feel like it, you remember the wonderful, forgotten blessings that you take for granted. How do you practice gratitude? Here are a few ideas. ~ Keep a gratitude journal. Write down every little thing. It’s amazing how quickly the pages will fill up. ~ My yoga teacher Chay Prieto taught me this one, and I love it! As you go to sleep at night, say thanks for all your body parts. (“I’m thankful for my eyelashes. I’m thankful for my scalp. I’m thankful for my teeth.) This is a better sleep aid than melatonin. I usually fall asleep before I get to my neck. Maybe I’ll start with my toes next time. ~ Take 5 minutes, sit still, breathe deeply and smile. Smiling is the language of your soul. It opens the floodgates of joy, allowing the reminders of your wonderful blessings to surface. ~ Walk your dog. Watch the joy he finds in sniffing each blade of grass. Dogs are a divine example of how to practice gratitude. They get excited about everything. A new treat? Thank you! A lizard to chase? Thank you! A piece of toilet paper on the floor? Thank you, thank you! ~ Volunteer. Helping someone else takes you out of your ego. Deepak Chopra says that ego means “edging God out.” Focusing on yourself and your perceived inadequacies will make you feel cut off from your spiritual source. Focusing on others with compassion reconnects you with God and your gratitude. I’d love to hear how you practice gratitude. Sharing ideas is how we increase our spiritual connection with each other. On this beautiful Thanksgiving, celebrate gratitude. But promise yourself that you will practice gratitude every day. It’s the key to deeper joy. I wish you the happiest Thanksgiving! This entry was posted in Soul Food, Wellness on November 22, 2012 by Karena.